“…Local artist Robbi Firestone who also has a series of private galleries that include her astoundingly vivid portraits of Maasai tribe members and an installation called The Empty Womb which deals with her infertility issues. The small rooms contain everything from hypodermic needles and other medical paraphernalia from Firestone’s own in-vitro journey, to sweetly crocheted baby clothes that will never be worn. If art is emotion on canvas, Firestone’s Empty Womb exhibit is a ragged cry of pain and acceptance.” Rachel Weingarten, Parade Magazine, Readership 54 Million. 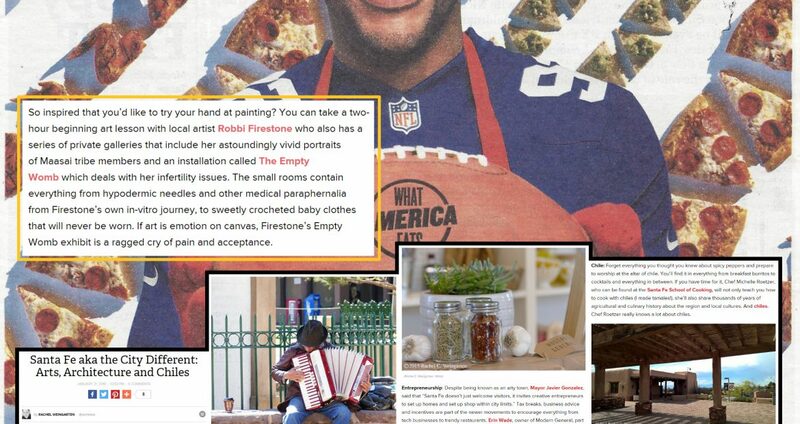 I’m honored that Rachel Weingarten from Parade Magazine has included The Empty Womb in a recent article about Santa Fe. This is a fantastic publication and I’m excited to have been included in it. Thank you Parade Magazine and Rachel Weingarten.